At the end of his long, prolific life, Titian was rumoured to paint directly on the canvas with his bare hands. He would slide his fingers across bright ridges of oil paint, loosening the colours, blending, blurring, and then bringing them together again. 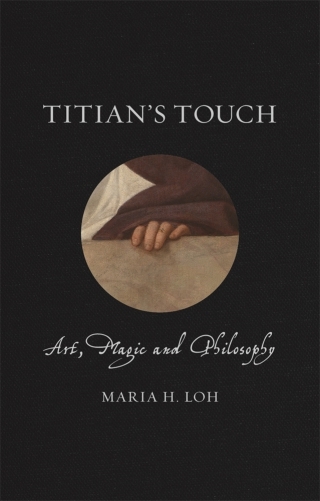 With nothing more than the stroke of a thumb or the flick of a nail, Titian’s touch brought the world to life. The clinking of glasses, the clanging of swords, and the cry of a woman’s grief. The sensation of hair brushing up against naked flesh. The sudden blush of unplanned desire, and the dry taste of fear in a lost, shadowy place. Titian’s art was a synaesthetic experience. To see was at once to hear, to smell, to taste, and to touch. But while Titian was fully attached to the world around him, he also held the universe in his hands. Like a magician, he could conjure appearances out of thin air. Like a philosopher, his exploration into the very nature of things channelled and challenged the controversial ideas of his day. But as a painter, he created the world. Dogs, babies, rubies and pearls. Falcons, flowers, gloves and stone. Shepherds, mothers, gods and men. Paint, canvas, blood, sweat and tears. In a series of close visual investigations, Maria H. Loh guides the reader through the lush, vibrant world of Titian’s touch. Maria H. Loh is Professor in Art History at CUNY Hunter College. Previously she taught in the Department of History of Art at University College London. Her publications include Titian Remade. Repetition and the Transformation of Early Modern Italian Art (2007) and Still Lives. Death, Desire, and the Portrait of the Old Master (2015). She lives and works in New York and London.